Are you constantly being asked “What’s for dinner”, or do you always walk through the door and wonder that yourself? Well, no more, as I have a quick tip that you can use to make life a lot easier for yourself! In my home file I have a Master Meal planner – which is basically a 4 week planner with breakfast, dinner and tea on it (there is also one for just tea if you only plan the evening meal). It’s detailed, which is how I like it – so that I only have to plan out 4 weeks and then can reuse over and over again. I used to simply have a copy of this on my kitchen wall, but although this planner is perfect for actually planning your meals, it was quite hard to see at a glance what was for tea, for example. 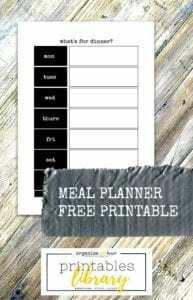 I decided that the best way to do this was to keep the meal planner in my home file as the master list, and use this to know what meals I need to shop for each week. But each week, when I look at it and sort my shopping list out, I can simply write down somewhere what the meals for that week were (and that week only, to keep it simple). Dead easy to see what’s what. I simply framed it in a click frame** (as I did with my shopping list a while back if you would like to know more details) and added it to the inside of my cupboard door alongside the shopping list. I have simply framed it and put the plastic cover over the top of the printable – so that I can write on the plastic each week with a dry erase marker, and simply wipe off and re-use the following week (saving paper!). Now all anyone has to do is look at this when they want to know what they will be eating that evening, perfect! Hi Mary – Yes I did use the plastic – it’s quite smooth so works well and protects the paper – although you could equally remove the plastic and just write directly on the paper. Welcome to the site and I’m really glad you found it! We display on the fridge. Hi – really glad you like the idea of a master list – and I love the idea of a pad to use – does it hang up on the wall? It would be really similar to my approach if so.